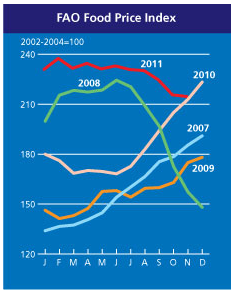 The FAO Food Price Index (FFPI) averaged 215 points in November 2011, marginally (1 point) down from October and 10 percent (23 points) below its February 2011 peak. Among the various commodities, a recovery of oils quotations compensated for a decline in sugar, while prices of the other commodity groups were little changed. At its current value, the FFPI is only 1 percent (2 points) above its level in November 2010. At one level - it's good news for those of us that like to eat that food prices are declining (though not such good news for the farmers that grow the food). Still, my take looking at the graph above, is that this looks akin to other indicators such as European new industrial orders or world trade - there are signs of a fairly abrupt drop-off consistent with the beginning of a new recession (compare to the fall in the food price index in 2008). The incipient stabilization in November contradicts this story a little, however. In 2008 the index starts to drop in July 2008 (the official start of recession in the US was Dec 2007 but Lehman didn't file for bankruptcy and initiate the really abrupt phase of the global crisis until Sep 2008). It then drops steadily until bottoming out in February 2009. The current price drop-off really begins in September 2011, but has eased a bit in November. We shall have to see what December brings. If banks in Europe start failing left and right the global economy will go into reverse and this index will drop a lot further. If the European authorities can stabilize the crisis short of that, then not. From November 2010 until July 1, 2011 the NY Fed created $600 billion and bought T-bills from banks on the open market. That cash injection sure caused a lot of inflation, no? You have to think that few in the industrial West will eat less, or even eat less meat, just because of a recession. The bizarre behavior of food prices in the past five years has to be due to inflation-deflation pressures as well as the bio-fuels debacle. That food prices chart looks a lot like a chart of Brent crude oil. "At one level - it's good news for those of us that like to eat that food prices are declining..."
It is now abundantly clear that your analysis is unbalanced. As a trained econo cockup optimist it is obvious to me that you do not understand the law of substituteobfuscation. Why is this good news? Do you intend to eat more now? What about the obesity epidemic? And what if you are wrong and food prices go higher? Surely you realize that people will simply eschew food for another product as the price rises? You probably believe in peeek oil LOL!